Many interesting geological features are found in this short section of narrow canyon on Eakin Creek. Special features in the park include a small, narrow rock canyon with steep walls, natural tunnels and rock outcrops. There is a scenic 8-metre waterfall on Eakin Creek, within the park. There are steep rock cliffs on either side of the canyon. 5 km west of Little Fort, south of Hwy #24. There are no public roads entering the park and no developed trails in the park. The only way to access the park is through self-guided exploration with a map and compass. History: The park was created April 30, 1996 as a result of recommendations made in the Kamloops Land and Resource Management Plan. Remnants of old placer gold mining operations (sluice box) are in the park. Conservation: This park contains a small, narrow canyon with steep walls, a natural rock tunnel, rock outcrops, and a picturesque 8 metre waterfall. Wildlife: Well-established wild trout stocks are found in Eakin Creek. Predicted bat habitat. 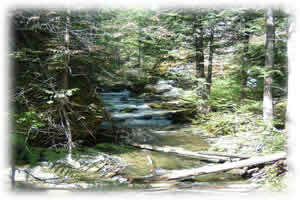 Well-established populations of wild trout are present in Eakin Creek. Anyone fishing or angling in British Columbia must have an appropriate licence. Pets/domestic animals must be on a leash at all times and are not allowed in beach areas or park buildings. You are responsible for their behaviour and must dispose of their excrement. Backcountry areas are not suitable for dogs or other pets due to wildlife issues and the potential for problems with bears. Backcountry areas are not suitable for dogs or other pets due to wildlife issues and the potential for problems with bears. There is no viewing platform in the park but there are wildlife viewing opportunities. This park also has picturesque waterfalls and an interesting natural rock tunnel. There are snowshoeing and cross-country skiing opportunities in the park but there are no designated trails.